Guess what? This is our 900th review post! Not just 900 posts, but 900 review posts! Now considering the fact that just 4 or 5 posts are re-reviews, and then factoring in that dozens of posts (like fights) cover multiple products means that we've covered well over 900 unique frozen products on this blog! That also means we're just a stone's throw away from hitting a 1000! Not every review is a huge dissertation, but sometimes a half decent or so-so treat only deserves a couple of pics and a few choice words. Who knows what the next review will be, but at least you can count on the fact that it won't be a repeat! To celebrate our achievement, I've got a TRIPLE review for you guys. 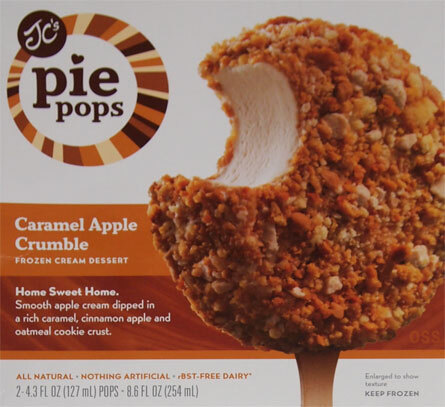 I was blown away by my first JC pie pop experience and so I couldn't wait to tear into their other three flavors. So, without further ado, it's time to get hungry. 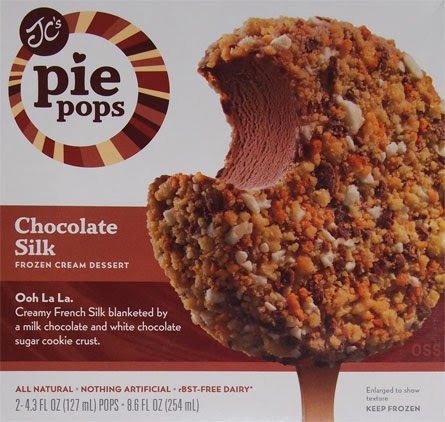 With my expectations set exceptionally high, I dove into the box of Chocolate Silk Pie Pops next. It took just one bite to detect that coconut oil had been added to add an additional layer of complexity to this pop... unfortunately, you all know how I feel about coconut. I still love the pie pop concept, but where that pastry filling flavor sealed the deal in my first trial run, the coconut here is making me a little skiddish. It's still well made and I adore the pie crumble coating. Look closely and you can see tiny white chocolate chips. That's just fun. I just would have preferred a bit more of a cocoa vibe rather than this coconut thing, but I have to look at it this way. 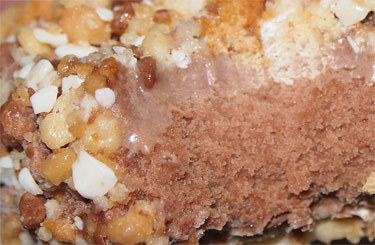 Lastly, check out the frozen cream texture. At least that's how it look when you are impatient and don't let it warm up a little! 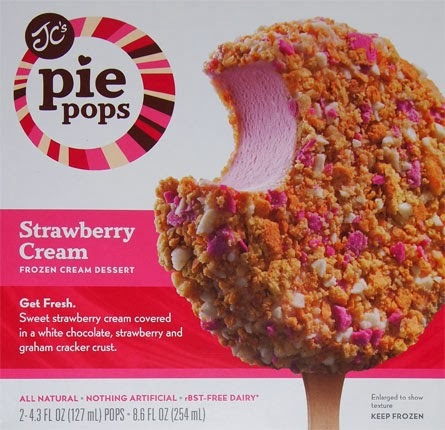 Next up is JC's Strawberry Cream Pie Pop. "Sweet strawberry cream covered in a white chocolate, strawberry and graham cracker crust". Now please keep in mind I was crazy hungry when I absolutely devoured this pie pop, so my opinions are going to be a little vague. I went in expecting some kind of all natural strawberry flavoring, but instead I got a much more complex fruity flavor. It was more like fruity cereal then it was strawberry gelato. This is not a bad thing. This is my third pop and I should have known this one was going to bring it's A game. These big purple bits are suppose to be strawberry but I really do get a more general berry vibe from them, plus check out the huge graham chunks. Man these bars are fun fun fun. The fact that it's huge and filling is kind of the icing on the cake with these bars. I can't wait for everyone to try them. 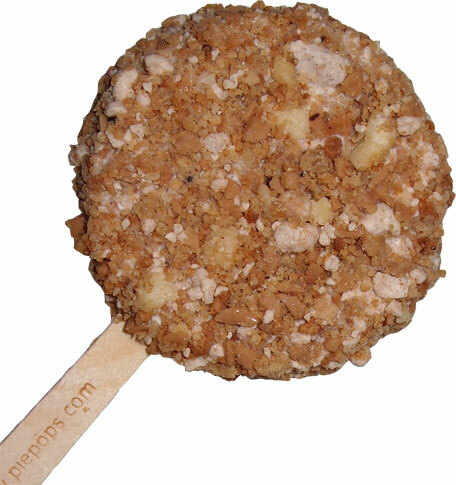 Last, but certainly not least, JC's Caramel Apple Crumble Pie Pop. They are "smooth apple cream dipped in a rich caramel, cinnamon apple and oatmeal cookie crust". I like these pops, but on the first sampling (straight from the freezer), the apple is taking center stage while I'm having trouble picking up the caramel and the cinnamon. It still tastes good, and it smells fantastic, but I want to dial the apple flavor back a bit. On the second try, I let the pie pop sit a few minutes (while I took photos) and the tempering seems to have really released the cinnamon and crumble aspects of this treat. It's hitting the spot and really reminding me of the cinnamon donuts I love to have for breakfast. Good times! I love how strong and unique each pie pop flavor is. These aren't some low budget, half-flavored treats. These are all out stunners that want to win you over. The best part of their quality is that your mind goes crazy with other possibilities. Now we're all different, and we'll all have different visions, but can you image versions like chocolate cream pie? pumpkin pie? key lime pie? (debuted 2014) maybe even s'mores? (also coming soon!) 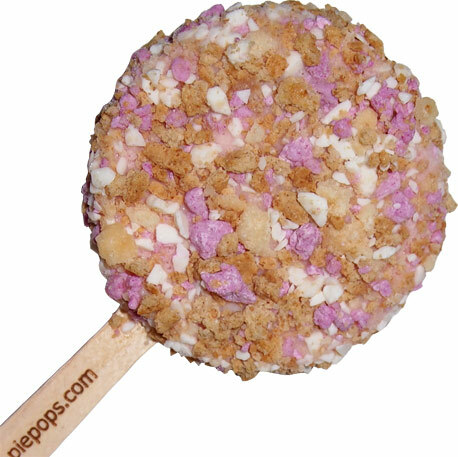 There are so many combos out there and I can only hope and dream that the company grows large enough so that every year we are treated to a new pop flavor. I feel tortured seeing these pops and not being able to have them. I want the Caramel apple one! Excited to spot these on the shelves at my local QFC (Kroger) in Washington state! 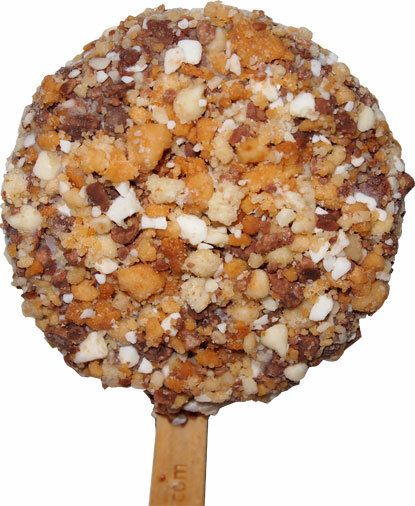 I bought the Caramel Turtle pie pop at Fresh and Easy about four days ago. Good thing there's two in a box, because it was soooo good, I don't know if I could share it with anybody! Not even my husband! I had the smores one and the marshmallow flavoring is so strong, it tastes like perfume..bad first impression!